Happy Sunday! This year I was supposed to be doing a Sunday “new apartment” blog series but as life has gotten progressively more hectic as we transition out of the holidays I admittedly haven’t done much in the way of decorating! 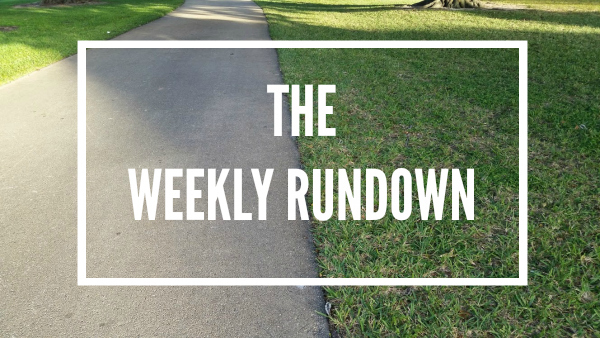 I’m temporarily replacing that series with a “Weekly Rundown” series where I’ll share my workouts and runs from the previous week! I’ll include more specific running details here than I do during my weekday posts so this will read like a workout log with a few personal details thrown in. My head was spinning thanks to a sinus headache that just would not go away. Our weather has been bouncing around like crazy and it’s wrecking havok on my allergies and sinuses. Did a quick upper body strength workout and then Lauren’s 10-minute plank sequence with a couple of modifications. My legs were feeling a big tight and sore from the race on Sunday and my core was feeling worked over from Monday’s planks, so I took a short run down to the beach. It was warm but breezy which felt really great. I incorporated nice and easy walking breaks using 2 min run, 1 min walk intervals. Weather really cooled down by the evening when I went out for my run. At first my calves felt tight, but they warmed up by mile two. I was tempted to go for another couple of miles since I had a little extra time and lots of energy, but I decided to stick to my coach’s schedule since it never fails me. Went with yesterday’s easy 2/1 intervals again. Caught up on Better Call Saul episodes with Adam on the couch and was in bed by 11:15pm. Not much to say about this workout, it was pretty standard. Wall-sits were a killer just like always! Caught up on some missed TV episodes with Adam after – Always Sunny in Philadelphia and Workaholics. I was planning to run 3-4 miles this day, but ended up taking a total rest day. What’s the point of being in a reset period if you don’t take full advantage of it, right? Instead I watched reruns of Seinfeld and painted my nails. I’m really loving the Fashion Playground color by Essie! It was a very exciting Friday night. Started in the gym with an upper body strength and core routine. Added in assisted pull-ups for the first time in a while, then went on a really nice mid-afternoon run. It’s not often that I get to run in the middle of the day, usually it’s way too hot out! Four miles down to the beach and back using 2/1 intervals. Started out at 13:44 pace and ended at 12:55 pace. Didn’t mean for it to be a progression run, it just naturally happened and I went with it since it felt good. Great workout before eating some delicious Mexican food! Just a nice easy breezy run down to the beach. It took me a while to wake-up which is typical for me during morning runs. Used the 2/1 intervals again and just enjoyed myself. There’s nothing like sunrise at the beach! You and Adam have the same taste in TV as Paul does! Glad you were rewarded with some cooler temperature this weekend. 🙂 It’s crazy how much easier a run can be when it is not so stinking hot. Great job! I love that you include the weather in there too 🙂 How is Better Call Saul? I have been watching so much TV lately that we’ve decided to save BCS for the summer. Your Friday night sounds like a blast to me! So far I am really liking BCS! I thought about waiting for the season to end so I could marathon my way through all the episodes (isn’t that the best way to watch a good show? ), but I knew my co-workers would be talking about it in real time so I dived in! I still have so much work to do on our apartment and we moved in in November! I’ve always been slow at that stuff, and usually I just want to take it easy on the weekends after working all week instead of running around trying to find stuff for the apartment. Nice reset week! I am with you 100%! On the weekends the last thing I want to think about is decorating, shopping for decorations or hanging decorations! One of my favorite things to do on a Friday night is paint my nails and watch TV. My guilty pleasure TV show is Cops. I think I’ve seen every single episode but I still love watching it. Love that you are going to start doing a weekly rundown – fun to read it all in one spot!!! Hope you are feeling recovered and rested after ending your half marathon season! I have taken my holiday decorations down.. but not packed away. They are sitting on an old futon that is unused haha. I like reading weekly workouts – good week. That’s a great week of training! It’s such a good mix of cross training and running. The weather has been crazy on my sinuses too. I wish it would just pick a temperature and stay there! Exactly! I think this week the weather is finally going to stabilize. Unfortunately it looks like it’s going to stabilize at 80 degrees! Nice week! I’ve been wondering how you’re doing with the cold front that came through there, but it sounds like it hasn’t affected your runs at all. Great! There were a couple of nights last week where I was so cold I could barely sleep because we Floridians don’t believe in turning the heater on, haha! The runs were great though! Running in the 60s and 70s is so nice! The one night it dipped down below 60 was a non-running day for me so I escaped that! Have you started watching Better Call Saul?! It’s so good!